Let’s say you wanted to watch parrots in the wild instead of parrots in a cage. Where would you go? Mexico? How about Texas? Red-crowned parrots (Amazona viridigenalis) breed in the Rio Grande Valley in cities such as Brownsville, San Benito, Harlingen, Weslaco, and McAllen. The birds are colorful, gregarious, and rather vocal inhabitants of Valley neighborhoods. The red-crowned parrots in the Reed’s yard are resplendent birds with scalloped green feathers accented by crimson patches on the wings. They have scarlet-capped heads and iridescent green faces blushed with lilac-blue. The birds are nesting in a hollowed out Washingtonian palm, a typical nest location for the Valley’s red-crowned parrots. They grasp the jagged edges of the palm with toes specially developed to act as pincers, and steady themselves with a big beak that acts as a third foot. My wife sat in a photography blind atop a one-story scaffold photographing the nesting parrots. She, not having pincer feet or a robust beak, nearly fell off the scaffold---whether from excitement at being so close to the parrots or from the rickety platform, I can’t say. I watched from a discreet distance, thinking the parrots looked like dinosaur type birds. Their large hooked beaks, foot-long stocky bodies, short legs, and oversized feet made them look like they could swoop down and tear out the flesh of a cat. As they flew swiftly on shallow wing beats and called out in a rollingkeeerr yuuu awk awk awk sound, I wondered if the Jurassic period’s Pterodactyl sounded like that. Red-crowned parrots are peaceful creatures that feed on fruits and nuts, not animal flesh. They’re social birds that always move around in flocks. Parrots are so adapted to congregating with each other, that a lone caged parrot will display maladaptive behaviors such as racing around its cage and continually mimicking human sounds. Parrots are certainly mimics, and often mimic calls of other wild birds. While I was watching the parrots in the Reed’s yard, I heard them mimic the call of a nearby great kiskadee. But when a caged parrot mimics a human and says, “Polly-want-a-cracker,” it may really be saying, “Parrot-want-a-partner.” That’s because a parrot lives best when living with other parrots. This may explain in part how red-crowned parrots---a popular caged bird --- colonized the Rio Grande Valley. Illegal trafficking of birds over the last 20 years across the Texas-Mexican border brought untold numbers of red-crowned parrots into the Valley as caged birds. Many escaped or were released into the semi-tropical environment of the Valley, and congregated with each other. But that’s not the whole story. Scores of the Valley’s red-crowneds may have flown across the border intentionally. 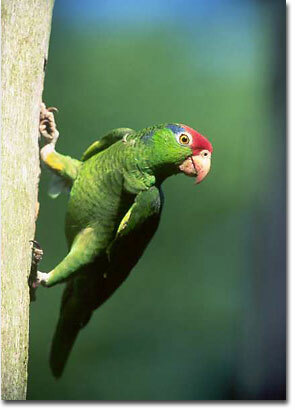 The native range of the bird is in the lowland forests of northeastern Mexico, just 180 miles from the Texas border. Red-crowned parrots are strong enough fliers to make the trip. After all, they can fly 60 miles round trip just going from roosting to feeding sites. The birds had plenty of incentives to wander up to the Texas border. Their native Mexican forests had drastically declined due to land clearing, and their native fruit trees had been lost to severe freezes in the late 1970s and early 1980s. Finally, the illicit pet trade that robs baby birds out of the nest had decimated parrot populations. Twenty years of parrot smuggling and land clearing in Mexico may account for the rise of resident red-crowned parrots in the Valley. But the question bird experts cannot yet answer is whether the majority of parrots flew into the Valley on their own or escaped from cages along the South Texas border. McKinney’s research led the Texas Bird Records Committee to place the red-crowned parrot on the official list of Texas birds. However, the committee listed the bird as an “introduced” species, pending further study of how it populated the Valley. As an introduced bird, the parrot has no protection under Federal or State law despite the fact that a wandering Mexican songbird like the blue bunting does. The poor parrot suffers from discrimination. However, the city of Brownsville is proud of its red-crowned parrots, and passed an ordinance in 1992 protecting the birds and their nests. Standing in the Reed’s yard, I saw a flock of 20 green parakeets land in an oak tree near the nesting red-crowned parrots. I remember thinking, there’s no place like Texas when it comes to bird watching. Places you can find red-crowned parrots in the Valley include the Valley Nature Center at Gibson Park in Weslaco and behind the Wal-Mart store in San Benito on Business U. S. Highway 77. You can get a weekly report on parrot locations by calling the Rio Grande Valley Rare Bird Alert at 956-969-2731.